This easy Bean Salad recipe is a great side dish in the summer but yet hearty enough for a fall side as well! Quick to make, packed with flavor, and travels well making it perfect for potlucks! Who’s ready to make beans great again?! I think we all know that beans can get a bit of a dull reputation. They are often associated with something that’s just there for extra protein or vegetable source. Well, that stops today because this easy classic bean salad recipe is about to knock your socks off. This go-to party side dish pretty much having its own party in a bowl. Four types of beans and a sweet yet tangy marinate come together to make a combo you won’t stop talking about. What’s In A Classic Bean Salad? 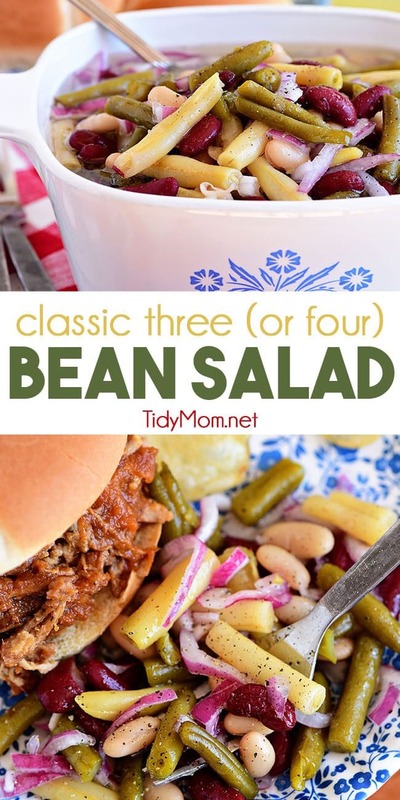 Your mom probably made three bean, salad, but it’s time to kick things up a notch and try it with four beans! I know that might sound crazy, but trust me that extra bean variety it totally worth it! 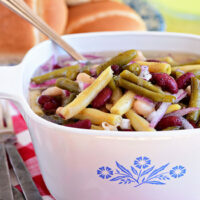 If you want to stick to the age-old classic three bean recipe, you” just use green beans, waxed beans and kidney beans. If you like to live on the edge and switch things up then add cannellini beans, as I did, or try it with garbanzo beans. Both are great options to add some extra flavor to this classic dish. What are Yellow Wax Beans? Yellow wax beans are almost exactly like green beans. They essentially start out the same, but the different properties used to grow them results in their difference in color and texture. Green beans get their color from chlorophyll, and yellow wax beans differ because they have been bred without the chlorophyll to end up with no pigment. Most people say this difference doesn’t change the flavor much at all. So if you’re a fan of greem beans, I wouldn’t shy away from wax beans. Tips For Making A Bean Salad People Will Go Crazy Over! 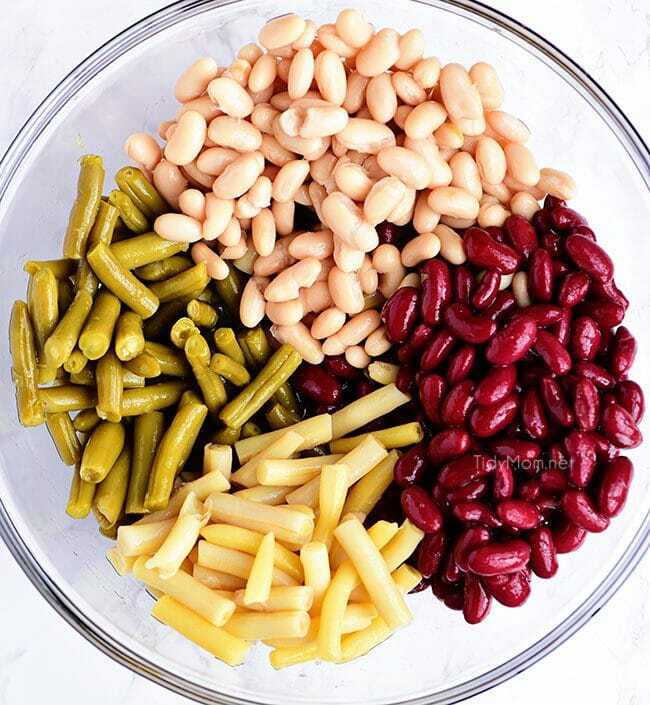 Blanch the beans: when using fresh green beans and waxed beans – trim the ends, cut into 2-inch pieces, then blanch for 3 minutes in boiling water then rinse in cold water and drain. 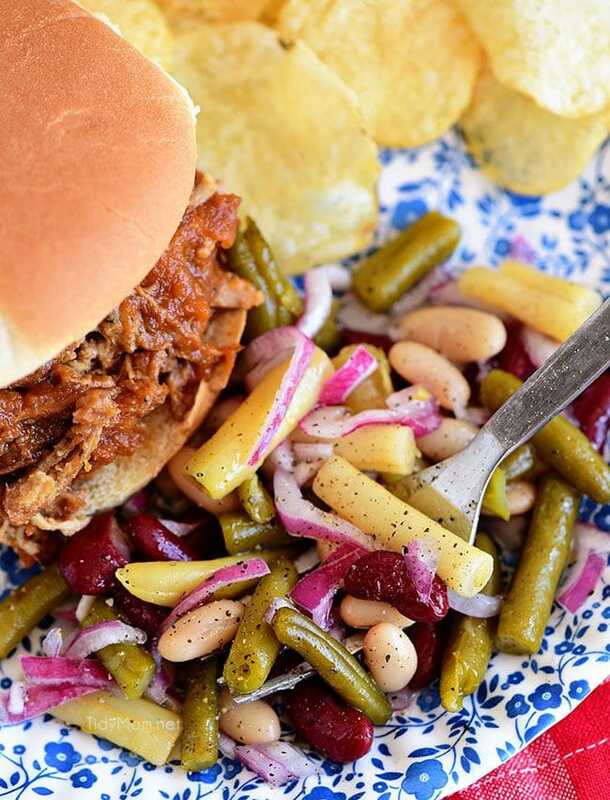 There’s no better backyard bbq party dish than good homemade bean salad! It’s the perfect dish to simply whip together with no hassle. Not to mention, one batch makes enough to feed you and all your closest friends and family! Now you just need a main dish to go with your perfect party side. Here are a few of my favorite backyard party dishes. With the qualities I stated above, it’s clear bean salad was pretty much made for parties, but don’t just stop there. This recipe is a great dinner dish too. Growing up in the midwest we served bean salad with dinners more often than not. Don’t worry about having a bunch of leftovers if you don’t have a crowd to feed at your weeknight dinners. Simply just add some bowtie pasta to what’s left and let it sit overnight in the fridge for a whole new salad the next day. Caprese Pasta Salad A fresh, easy and simple summer pasta salad perfect for BBQs. It has all the flavors of a traditional Caprese salad in pasta form! Guacamole Deviled Eggs A new take on everybody’s favorite comforting appetizer, it’s amazing how a little tweak like adding smashed avocado, garlic salt, and lemon really takes them over the top. Serve ’em up on game days, and right through the spring holidays. BLT Red Potato Salad Made with an avocado ranch dressing along with bacon, lettuce, and tomato! It’s a simple crowd-pleasing side dish for any size gathering. Maple Dijon Apple Coleslaw A healthy coleslaw recipe with a sweet and savory twist on the classic picnic salad. The creamy dressing is lightened up with Greek yogurt for a coleslaw without mayo. You can enjoy this quick and easy side dish at a barbecue or party any time of the year. Grilled Carrots With Chipotle Lime Dip Seasoned grilled carrots with chipotle lime dip is a surprisingly easy and healthy way to serve carrots, and boy are they full of flavor. They make a wonderful snack or a great addition to your dinner table tonight! Instant Pot Garlic Parmesan Corn on the Cob The best and the fastest method to cook corn on the cob. Brushed with garlic Parmesan butter, this corn on the cob is the perfect summer side dish! Like This Bean Salad Recipe? Pin It!! Your New Backyard BBQ Favorite! 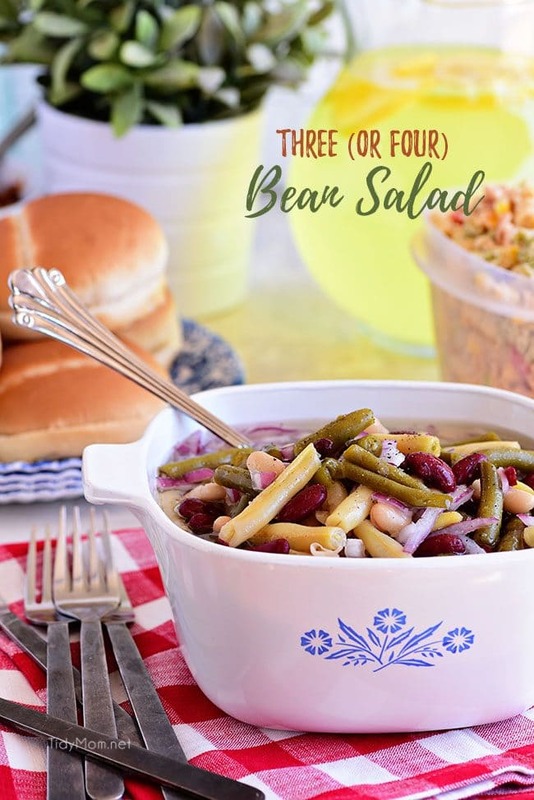 In a sea full of pasta salads and mac and cheese, this classic bean salad recipe is sure to stand out in the crowd at your next party. So be that one who steps outside the box and show up with a side dish no one will be able to forget. Trust me you’ll thank me later! 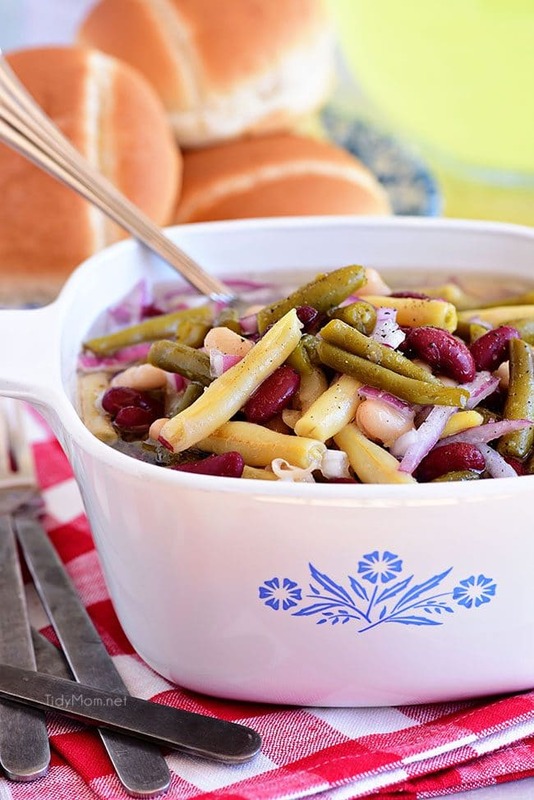 This classic Bean Salad recipe is a great side dish in the summer but yet hearty enough for a fall side as well! Quick to make, packed with flavor, and travels well making it perfect for potlucks! Mix beans, onion, sugar, vinegar and oil in large bowl. 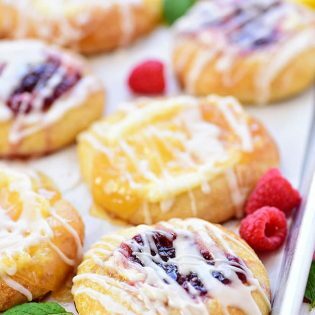 if you want less sweetness, try cutting the sugar down to 1/2 or even 1/4 cup or try adding more vinegar. I love this salad! So flavorful!! 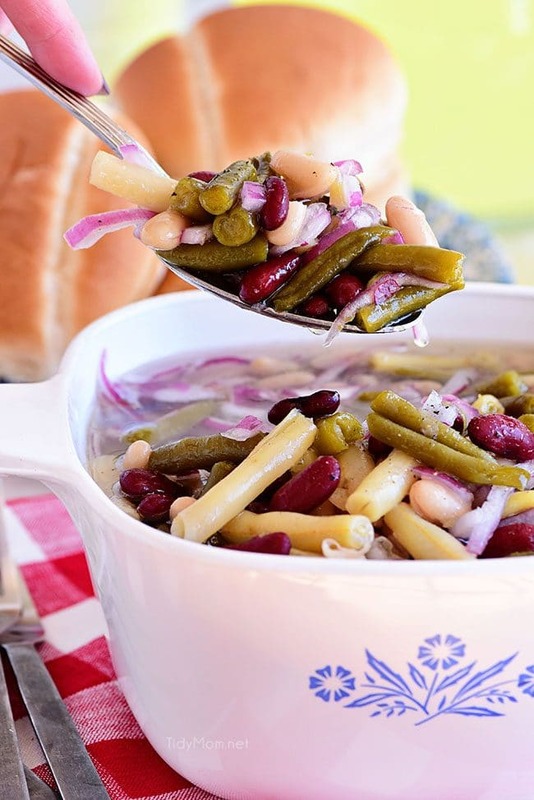 BEST Bean Salad….I make this ALL the time!!! Thanks for using the Corningware dish! I’m old, so I know Corningware! In fact, I use it more now than ever! Best cookware for easy cooking. Heat it, chill it, and serve in the same dish! Can’t beat it! Always use for leftovers that have to be heated up. 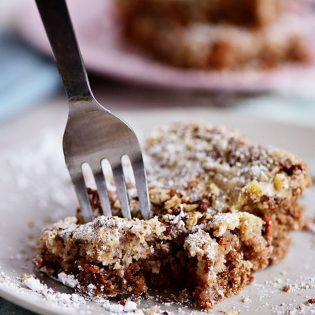 I’ve always made this in some form- add corn to change it up! Delicious with anything! I thought it was the perfect dish to photograph the bean salad in, since it’s what my mom always made it and served it in! and I agree, I love Corningwear! !